'Several' is greater than two, but not many. Three fits the bill. Fair enough. I don't think of 3 or 4 when I use the word several, but that's a matter of the language being imprecise. We agree on the technical details. Water vapor needs heat to exist in considerable quantities in the atmosphere. We return then to the whole chicken and the problem, then - where the Earth receives enough energy from the Sun to be a mere 255 Kelvin... yet the surface continues to be warm enough to have water vapor in the atmosphere. Why would such a condition persist perpetually? I would say it is because the planet's ecology is a stable system using both positive and negative feedbacks. We know this simply from the fact that it has sustained life for as long as it has. If the system were unstable in the least, there would have been runaway conditions long before man walked the planet on two feet. That doesn't mean there can't have been anomalies, just that all of the anomalies undergone in the planetary history were correctable without interference. Since we are nowhere near historical conditions, it follows that our situation is also correctable without interference. Ergo, we should not interfere. Given that assessment, the next question becomes one of academics: what are the feedbacks and how do they operate? That is what climatologists are trying to discover with their models. Only the politicians and the pundits are taking the extrapolations and presenting them as solid evidence of future happenings. Ah, but you are forgetting something - runaway conditions would exist only if water vapor were the only means of redistributing heat in the atmosphere. At some point, given our periods of volcanic (or otherwise) induced cooling, the carrying capacity would not have been sufficient... and it certainly shouldn't have gotten warm enough to increase temperatures. Therefore, there must be something more than water vapor. Glaciation has been a common theme in our geologic history - the Earth tends to be cooler, not warmer; despite this, enough warmth has persisted indeed. The answer to my question about what heated up the atmosphere enough such that water vapor could exist is carbon dioxide. The atmosphere nearest the surface is warming now, yet water vapor is remaining virtually the same or declining in the atmosphere. Of course, warming near the surface means cooling elsewhere, which is a good reason for why water vapor might decline in higher parts of the atmosphere. However, warming near the surface should mean significantly increased water vapor... but that doesn't seem to be the case. I suspect that this is due to decreased evaporation (PDF), as our pollution dims the surface and reduces the amount of sunlight - which is responsible for most evaporation - reaching the surface. Air temp 19 in Alabama... and not forecasted to get much warmer until next Saturday/Sunday. No idea about wind chill, cause I got me a warm spot and I ain't moving! Al Gore, where's that Global warming you promised me? Yeah uh, that's why it's so cold. From California to Alaska, it’s been a weirdly warm winter. If it’s cold where you are right now, chances are you’re in the eastern U.S. — which is practically the only place on Earth that’s significantly cooler than normal at the moment. Contrast that with the West Coast, which has been stuck in unusually warm weather all month long. In California, it still feels like summertime. Los Angeles has experienced bone-dry winds and occasional highs in the 80s, the perfect conditions for wildfire. Alas, such weather seems to support further skepticism, and it happens to keep happening in a large portion of the most powerful country to ever have existed on Earth. I know. You were replying to a joke. I thought the sheer flippancy of my post made that self-evident. Your previous post replied to a meaningful debate. I'll have a response to it shortly. That't just pure nonsense ... perhaps, there is "local" effects where you reside,but here ... the water vaporisation is plenty ... it's "thick" fog, to be presise. You "religious" mumbo jumbo freaks, are freaking everyone out ... and posting some "local" data, while ignoring history. Tell me, how did the Dynosaurs exist? Why was it warmer, thousand years ago ... than it is today. 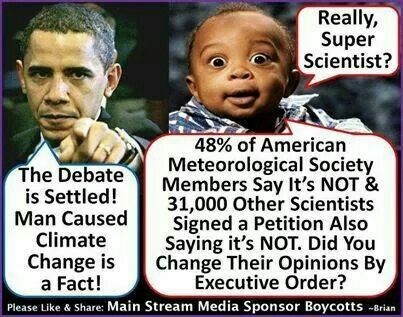 These are recorded and proven facts ... you just ignore'em. There are huge local damages that we create, every species will affect its environment. We learn as we go along ... you wanna believe in "Armageddon", or some similar mumbo jumbo doomsday religion ... sure, go to church and believe there. Ah, but you are forgetting something - runaway conditions would exist only if water vapor were the only means of redistributing heat in the atmosphere. I am unsure of where you get this statement. Runaway conditions (system instability) can occur for a wide number of reasons. It's not even a question of having sufficient negative feedback; it is a question of the resulting differential equation after all feedbacks are included having a stable (real and negative) solution set. Water vapor is a critically important feedback in our system, but is obviously not hyper-critical. Otherwise we would see continual instability in areas of extreme humidities, such as deserts and over ocean expanses. We do see some lessened stability in some of these areas, such as annual hurricane formation off the Atlantic coast of Africa, but even these seem to retain some sense of stability. At some point, given our periods of volcanic (or otherwise) induced cooling, the carrying capacity would not have been sufficient... and it certainly shouldn't have gotten warm enough to increase temperatures. Therefore, there must be something more than water vapor. I think you are confusing heat retention with heat generation. All heat on the earth comes from one of two sources originally: the solar radiation received, and to a much more minor extent, internal heat leftover from the planet's creation and created by internal radioactive decay/gravitational flexing, etc. I only include the internal heat source as a matter of completeness; the solar radiation is the primary source by relative orders of magnitude. The issue is heat retention. As solar energy comes in contact with the planet, some is reflected back into space through a reverse greenhouse effect. The remainder strikes the surface, either heating it or reflecting according to the albedo of the surface. That which is reflected undergoes another, this time minor since the wavelengths have not changed, greenhouse effect and exits into space. The heated areas of the planet then experience both conduction, heating the lower levels of the atmosphere, and blackbody radiation. Both these are temperature dependent, and thus are also dependent on the thermal mass of the various materials comprising the earth's surface. This is where water begins to play a large role. The high specific heat of water means it is able to hold more heat energy with a smaller increase in temperature, giving it a higher relative thermal mass. This heating of the surface being nonuniform also gives rise to uneven heating in the atmosphere, causing convection currents (wind) that creates our weather patterns and distributes heat. Water can also evaporate or even sublime directly into water vapor. As a vapor, it does not exhibit the typical characteristics of the three well-known phases; these are due to inter-molecular forces and do not enter into play when molecules are separated. But water does maintain it's spectral properties as a vapor, and acts to absorb/re-emit large ranges of infrared and even some visible radiation. Other gases, such as carbon dioxide, do come into play. They are not as important as water vapor, though, for two reasons: first, there is less of them available typically, and second, they do not have the wide range of absorption spectra in the infrared that water does. The problem scientists have in determining the extent to which carbon dioxide (or any of the other mechanisms) contribute to the system stability is that the planetary system is in constant flux. We know, for instance, that a cloudy night will typically be warmer than a clear night, because the clouds (water vapor) will reflect some of the radiation. But we do not know how much will be reflected, because we cannot precisely calculate the thickness of the clouds, or even if there will be breaks in the clouds. I think I see the issue now; you are assuming that the atmosphere in early development was too cold to accept water vapor, and thus too cold to allow the planet to heat up based on water vapor alone. But there was heat, in the form of solar radiation. That would warm the surface, which would then warm the lower levels of the atmosphere by conduction. Also, it is accepted that plant life was the first life form on the planet, with animal life forming later when the oxygen content had increased to high enough levels. Thus, the early planet would have had an atmosphere that could have easily been 20% or so carbon dioxide. Even though the greenhouse effect is not linear in relation to concentration, having 500 times the present amount would have made some difference in the amount of effect it would have had. So there was plenty of heat available to slowly warm the planetary atmosphere to where it could stabilize with water vapor playing a role as we see today. The graph appears to show relatively stable levels in the lower atmosphere. The upper atmosphere has been declining lately, with the middle layer declining before that (and both declining at the beginning of the time span). This could be due to reduced amounts of evaporation (as you seem to suggest), but I doubt that would be the cause. While pollution certainly could play a role, the effect is minimal until the pollution level becomes absolutely intolerable, and we have wide expanses of ocean that are nowhere near that level. The decreases could be caused by a myriad of possibilities: changes in pressure or temperature could cause a change in the humidity. Humidity is not a measure of the amount of water vapor held, but rather a measure of the amount of vapor held compared to the amount possible. Thus, we could be looking at a slight warming trend in the middle to upper layers, followed by an increase in the middle layer, followed by an increase in the upper layer. It could even be due to a change in the overall composition of the atmosphere, i.e. a bubble of methane rising through the atmosphere that happened to geographically coincide with the location of the sensors. In short, there are many reasons for the readings. 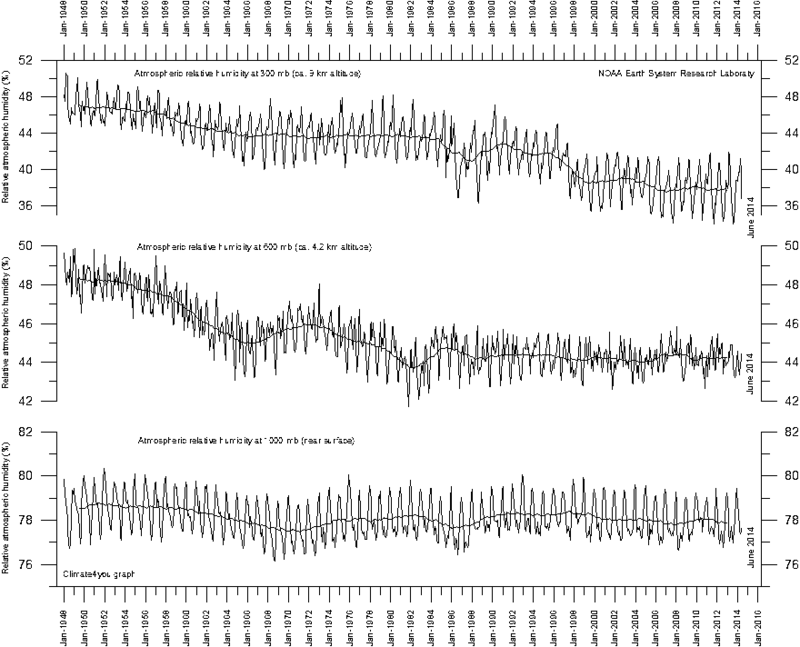 I read that NASA has some stuff on El Nino creating huge CO2 levels on the planet. Of course, this is what has been said thousands of times. Natural phenomenon causes it, not man ... any ideology, that assumes "man" is some precursor should be considered false from the outset. We live in the natural world, we didn't "suddenly" evolve in the industrial age, because we "suddenly" got intelligent. This just isn't true, and any intelligent human being should realise this. Truth is, we evolved because the environment became warmer. Because of this, common denominators such as "parasites" had a huge change in habitat, giving us in Europe and the US, the ability to thrive. There are millions of factors, that allowed us to grow ... but they key to it all, is climate change. Which causes changes, where parasites, viruses and bacteria had a slower rate than we did, and thus ... we managed to get ahead of them, and "grow a brain". The earth is NOT heated by the sun ... as said earlier, if the sun was our only heat source. We'd have frozen to death a long time ago. Life was born in the ocean depths, where small sulfur pockets of heat source from the center of the earth, became the breeding ground for bacterial life. Photo synthesis is only a part of life, it is not the key to life. Same applies to our atmosphere, and water the we thrive on. All these aspects come from the earth itself ... from its inner parts. This planet enjoyed a thick atmosphere, in it's early ages ... when the atmosphere was rich of oxygen, and dense ... covering a smaller planet, dynosaurs were able to walk this planet with their large bodies, in a dense atmosphere and lesser gravity, just as a whale does in the oceans. Ice ages, are caused by holes in the upper atmosphere ... possibly caused by passing meteorites burning the ozon layer, giving an escape to the atmosphere into space, and sudden, immediate cooling ... that freezes the mammoths, while still eating their lunch. The mixture between volcanoes, and meteorites punching holes in the atmosphere is what has caused cyclic events, and sustained life on the planet. It's in the gears of cooling and warming, that life exists ... what causes autumn, winter, spring and summer. These elemental powers, are currently far beyond our understanding and far beyond our ability to immitade or control. There are no "Gods" involved, and life itself is fragile ... there is nothing we can do, to stop a celestial catastrophic, extinction event from happening. Neither should we focus on it ... we should focus on how to expand, and sustain our life ... even if we are a "virus" or "cancer" of the universe ... we should not speculate, into wether there is or is not A god ... nor should we allow ourselves, or indulge ourselves into the thinking that we are "godlike". Our purpose, is to live ... sustain and extend our lives, even into the cosmos. Thus, what we face is a challenge ... we should not "stop" our progress, in fear of ourselves. But further it. Because the Chaos of the universe, is an uncertainty ... but it also has a certainty factor ... everything that has a beginning, has an end. We do not help ourselves, by "stopping" our evolution. Because one day, sooner or later ... another rock is going to punch a hole into this rock, and it's all going to end anyway. So, instead of locking ourselves in the bathroom ... in fear of going outside, and get run over ... let's build a better system. If, we are a cancer ... let's infect the Universe. The current climate change, is an opportunity ... an opportunity we should use to its fullest. Not shrink away in fear, that we are the cause of it ... because that's fallacy in logic. We do not "create" anything ... we only replicate natural systems, and use them to our advantage. Bear was sick, no connection to global warming, sorry your appeal to emotion won't work. So when did you examine the Polar Bear, quote was from a Photographer who has spent years working in that part of the world. Like I say you need quotes from people who live and have lived most/all their lives in the Arctic Regions. The elders have also noted an increased number of polar bear sightings further south. This is very unusual, and likely attributable to the lack of floe ice during the summer months, leaving polar bears no other option than to move to the land where people live. Unusual ice conditions have also brought tragedy to our communities. We have lost lives because of less predictability in ice and snow cover. The sea ice used to form in October or November, but in the winter of 2016 it did not form until mid-December. With warmer temperatures the ice has less time to form, which makes it thinner and causes it to melt earlier. Residents used to go duck hunting, an important springtime subsistence activity, by driving their snowmobiles to cracks on the sea ice that ducks follow, and then driving another ten miles to gather duck eggs. One resident recounted how his father would take the snowmobile in July to go duck hunting. Now residents feel lucky if they can still use snowmobile for this activity in June. In 2017, residents had to take their boats instead. The starving polar bear raises a question: Is fake news okay for a good cause?